Keating’s character is one of my heroes, but that’s not the only reason I showed this clip to my class. 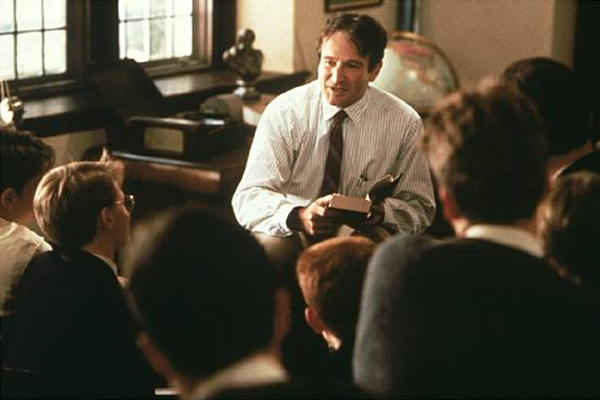 I showed this five-minute clip from Dead Poet’s Society (Peter Weir, 1989) to spark discussion on two ways to view poetry: (1) as a demonstration of a mastery of form and (2) as a vehicle to portray the human experience. Structuralism vs. Reader Response. Logic vs. Emotion. At this point, I had to quell my fervor. My supervisor was in the room and I had a review game to get rolling. My students performed beautifully, too–I hardly had a single wrong answer during the review, and later in the week test scores would prove to be very decent overall. I also had them submit a revised poem as part of their assessment grade, and many of them blew me away with the creativity, spirit, and truth that they weaved into their poetry. Especially since their classrooms have been very regimented and worksheet-heavy up until now, their achievements were spectacular to me. My students represent so many races, languages, cultures, economic backgrounds, and personalities–they each have amazing stories to tell. And their form wasn’t bad, either. I can’t believe this unit is already over. I’m very proud of my classes, and I can’t wait to see what else they can do. I hope Mr. Keating would be proud, too.